Golden Years Film Festival ‘Jivers’ at the National Science and Media Museum, Pictureville bar. 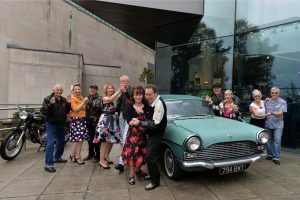 The dance session at Picturehouse Bradford – hosted by Marie McCahery from Bradford Lindyhop – got everyone in the fifties mood before a screening of the Elvis classic, Jailhouse Rock. The six day film festival hosted by Bradford UNESCO City of Film in partnership with Picturehouse at the National Science and Media Museum is aimed at an older audience but is open to all. Most events are being held at Picturehouse Bradford but there are also screenings at the Bradford Club, Delius Arts and Cultural Centre and Clayton Village Hall. 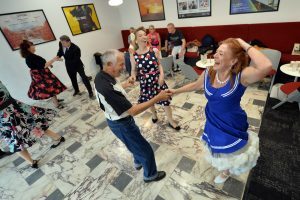 Festival Director, David Wilson from Bradford UNESCO City of Film said: “ Everyone absolutely loved the jiving and I’d like to thank Marie and the sixteen Lindyhop dancers for entertaining us all. The festival continues today with a screening of India’s highest grossing movie, epic romance Bajirao Mastani at Picturehouse Bradford. This is followed in the evening with classic comedy at the Bradford Club. The historic venue is opening its doors to the public for a triple bill of slapstick fun from Laurel and Hardy. Golden Years concludes tomorrow with a talk from Bradford UNESCO City of Film’s Director, David Wilson on the city’s film heritage and a screening of the new film, Goodbye Christopher Robin at Pictureville Cinema. The film gives a rare glimpse into the relationship between children’s author A.A Milne and his son Christopher Robin whose toys inspired the magical stories of Winnie the Pooh. The Golden Years Film Festival is supported by Bradford Council and sponsored by Northern Gas Networks.